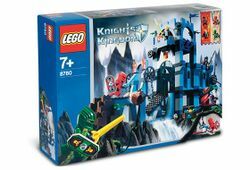 8780 Citadel of Orlan is a Knights' Kingdom II set released in 2004. It contains a large citadel complete with many features including a working drawbridge, rotating Axe wheel, vine climbing and a serpent. The Minifigures in this set include Santis, Rascus, Guardian, and a Shadow Knight. Some versions of the set contained three Knights' Kingdom game cards. The Citadel is built out of three sections, which can be easily disconnected from each other. The first section includes a large rock, with a brown staircase running up the middle of it. Once on top of the platform, there is a doorway with two boulders blocking it. When the boulders are pushed off the side, they pull the drawbridge up, allowing the minifigures to get through. Underneath the drawbridge there is a light blue base with a green frog sitting on it. The next section has three levels. The bottom level has a few plants and a skull. The next level is just a passageway, leading into the third section. Its walls, which are twice as high as the bottom level, hold up the top level. This level has a wall around part of it, with arches allowing minifigures to pass underneath. The Heart of the Shield of Ages sits on this level, on a specially designed stand. Along the back of this section is a vine, which can fold up. It has three sections, and can be used to lift a minifigure holding a bar up to the top level. The third section has two levels. The bottom level has the head of a serpent in it which when pushed forward slides out of the building and opens its mouth. On the next level up, there is a brown treasure chest with a battle-axe behind it which falls when the chest is opened. A slide sits on the far side of the building, and a wheel with four black battle-axes can spin around. The four knights were sent by King Mathias to retrieve the Heart of the Shield of Ages from the Citadel of Orlan. While they were there, each of their special skills was needed to survive the traps - Santis for smashing the boulders (one boulder in the comic), Rascus for climbing the vine, Jayko for eluding the serpent and getting through the battle-axes, and Danju for figuring out what happens when the treasure chest is opened. The Guardian handed the Heart of the Shield of Ages over to Jayko when they reached the top, after some discussion. Rascus has a printed body instead of a separate printed breastplate in this set because such a breastplate would hinder the vine wall-climbing function. Facts about "8780 Citadel of Orlan"